Heart failure occurs when the heart loses its ability to pump enough blood through the body. Usually, the loss in pumping action is a symptom of an underlying heart problem, such as coronary artery disease. 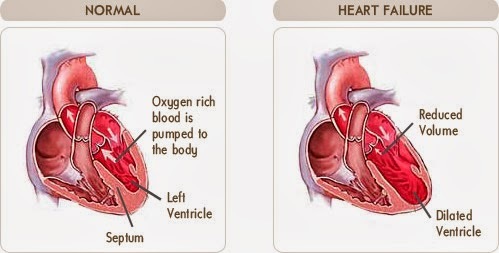 How serious the condition is depends on how much pumping capacity the heart has lost. Nearly everyone loses some pumping capacity as he or she ages. But the loss is significantly more in heart failure and often results from a heart attack or other disease that damages the heart. The severity of the condition determines the impact it has on a person's life. At one end of the spectrum, the mild form of heart failure may have little effect on a person's life; at the other end, severe heart failure can interfere with even simple activities and prove fatal. Between those extremes, treatment often helps people lead full lives. But all forms of heart failure, even the mildest, are a serious health problem, which must be treated. To improve their chance of living longer, patients must take care of themselves, see their physician regularly, and closely follow treatments. Heart failure causes 39,000 deaths a year and is a contributing factor in another 225,000 deaths. The death rate attributed to heart failure rose by 64 percent from 1970 to 1990, while the death rate from coronary heart disease dropped by 49 percent during the same period. Heart failure mortality is about twice as high for African Americans as whites for all age groups. In a sense, heart failure's growing presence as a health problem reflects the Nation's changing population: More people are living longer. People age 65 and older represent the fastest growing segment of the population, and the risk of heart failure increases with age. The condition affects 1 percent of people age 50, but about 5 percent of people age 75. As stated, the heart loses some of its blood-pumping ability as a natural consequence of aging. However, a number of other factors can lead to a potentially life-threatening loss of pumping activity. As a symptom of underlying heart disease, heart failure is closely associated with the major risk factors for coronary heart disease: smoking, high cholesterol levels, hypertension (persistent high blood pressure), diabetes and abnormal blood sugar levels, and obesity. A person can change or eliminate those risk factors and thus lower their risk of developing or aggravating their heart disease and heart failure. Among prominent risk factors, hypertension (high blood pressure) and diabetes are particularly important. Uncontrolled high blood pressure increases the risk of heart failure by 200 percent, compared with those who do not have hypertension. Moreover, the degree of risk appears directly related to the severity of the high blood pressure. Persons with diabetes have about a two- to eightfold greater risk of heart failure than those without diabetes. Women with diabetes have a greater risk of heart failure than men with diabetes. Part of the risk comes from diabetes' association with other heart failure risk factors, such as high blood pressure, obesity, and high cholesterol levels. However, the disease process in diabetes also damages the heart muscle. A number of symptoms are associated with heart failure, but none is specific for the condition. Perhaps the best known symptom is shortness of breath ("dyspnea"). In heart failure, this may result from excess fluid in the lungs. The breathing difficulties may occur at rest or during exercise. In some cases, congestion may be severe enough to prevent or interrupt sleep. Fatigue or easy tiring is another common symptom. As the heart's pumping capacity decreases, muscles and other tissues receive less oxygen and nutrition, which are carried in the blood. Without proper "fuel," the body cannot perform as much work, which translates into fatigue. Fluid accumulation, or edema, may cause swelling of the feet, ankles, legs, and occasionally, the abdomen. Excess fluid retained by the body may result in weight gain, which sometimes occurs fairly quickly. Persistent coughing is another common sign, especially coughing that regularly produces mucus or pink, blood-tinged sputum. Some people develop raspy breathing or wheezing. More frequent contraction, which increases circulation. By making these adjustments, or compensating, the heart can temporarily make up for losses in pumping ability, sometimes for years. However, compensation has its limits. Eventually, the heart cannot offset the lost ability to pump blood, and the signs of heart failure appear. In many cases, physicians diagnose heart failure during a physical examination. Readily identifiable signs are shortness of breath, fatigue, and swollen ankles and feet. The physician also will check for the presence of risk factors, such as hypertension, obesity, and a history of heart problems. Using a stethoscope, the physician can listen to a patient breathe and identify the sounds of lung congestion. The stethoscope also picks up the abnormal heart sounds indicative of heart failure. If neither the symptoms nor the patient's history point to a clear-cut diagnosis, the physician may recommend any of a variety of laboratory tests, including, initially, an electrocardiogram, which uses recording devices placed on the chest to evaluate the electrical activity of a patient's heartbeat. Echocardiography is another means of evaluating heart function from outside the body. Sound waves bounced off the heart are recorded and translated into images. The pictures can reveal abnormal heart size, shape, and movement. Echocardiography also can be used to calculate a patient's ejection fraction, a measure of the amount of blood pumped out when the heart contracts. Another possible test is the chest x ray, which also determines the heart's size and shape, as well as the presence of congestion in the lungs. Tests help rule out other possible causes of symptoms. The symptoms of heart failure can result when the heart is made to work too hard, instead of from damaged muscle. Conditions that overload the heart occur rarely and include severe anemia and thyrotoxicosis (a disease resulting from an overactive thyroid gland). 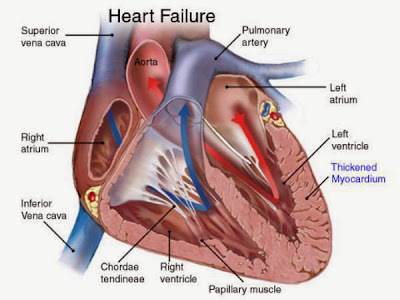 What treatments of Heart Failure are available? Heart failure caused by an excessive workload is curable by treating the primary disease, such as anemia or thyrotoxicosis. Also curable are forms caused by anatomical problems, such as a heart valve defect. These defects can be surgically corrected. However, for the common forms of heart failure--those due to damaged heart muscle--no known cure exists. But treatment for these forms may be quite successful. The treatment seeks to improve patients' quality of life and length of survival through lifestyle change and drug therapy. Digitalis increases the force of the heart's contractions, helping to improve circulation. Originally developed as a treatment for hypertension, ACE inhibitors help heart failure patients by, among other things, decreasing the pressure inside blood vessels. As a result, the heart does not have to work as hard to pump blood through the vessels. Sometimes, heart failure is life-threatening. Usually, this happens when drug therapy and lifestyle changes fail to control its symptoms. In such cases, a heart transplant may be the only treatment option. However, candidates for transplantation often have to wait months or even years before a suitable donor heart is found. Recent studies indicate that some transplant candidates improve during this waiting period through drug treatment and other therapy, and can be removed from the transplant list. Transplant candidates who do not improve sometimes need mechanical pumps, which are attached to the heart. Called left ventricular assist devices ( LVADs), the machines take over part or virtually all of the heart's blood-pumping activity. However, current LVADs are not permanent solutions for heart failure but are considered bridges to transplantation. Also, the list provides the full range of possible side effects for these drugs. Not all patients will develop these side effects. If you suspect that you are having a side effect, alert your physician. These prevent the production of a chemical that causes blood vessels to narrow. As a result, blood pressure drops and the heart does not have to work as hard to pump blood. Side effects may include coughing, skin rashes, fluid retention, excess potassium in the bloodstream, kidney problems, and an altered or lost sense of taste. Increases the force of the heart's contractions. It also slows certain fast heart rhythms. As a result, the heart beats less frequently but more effectively, and more blood is pumped into the arteries. Side effects may include nausea, vomiting, loss of appetite, diarrhea, confusion, and new heartbeat irregularities. These decrease the body's retention of salt and so of water. Diuretics are commonly prescribed to reduce high blood pressure. Diuretics come in many types, with different periods of effectiveness. Side effects may include loss of too much potassium, weakness, muscle cramps, joint pains, and impotence. This drug widens blood vessels, easing blood flow. Side effects may include headaches, rapid heartbeat, and joint pain. These drugs are used mostly for chest pain, but may also help diminish heart failure symptoms. They relax smooth muscle and widen blood vessels. They act to lower primarily systolic blood pressure. Smoking damages your blood vessels, raises blood pressure, reduces the amount of oxygen in your blood and makes your heart beat faster. If you smoke, ask your doctor to recommend a program to help you quit. You can't be considered for a heart transplant if you continue to smoke. Avoid secondhand smoke too. In addition to avoiding high-sodium foods, limit the amount of saturated fat, trans fat and cholesterol in your diet. A diet high in fat and cholesterol is a risk factor for coronary artery disease, which often underlies or contributes to heart failure. Your doctor likely will recommend that you don't drink alcohol if you have heart failure, since it can interact with your medication, weaken your heart muscle and increase your risk of abnormal heart rhythms. If you have severe heart failure, your doctor may also suggest you limit the amount of fluids you drink. Too much sodium contributes to water retention, which makes your heart work harder and causes shortness of breath and swollen legs, ankles and feet. For people with heart failure, the daily recommended amount of dietary sodium is generally less than 2,000 milligrams — check with your doctor for the restriction recommended for you. Keep in mind that most of this salt is already added to prepared foods, and be careful when using salt substitutes. Do this each morning after you've urinated, but before you've had breakfast. Notify your doctor if you have a weight gain of 5 pounds (2.3 kilograms) or more in a week. It may mean that you're retaining fluids and need a change in your treatment plan. Record your weight every morning and bring the record with you to your doctor's visits. If you're overweight, your dietitian will help you work toward your ideal weight. Even losing a small amount of weight can help. Moderate aerobic activity helps keep the rest of your body healthy and conditioned, reducing the demands on your heart muscle. Before you start exercising though, talk to your doctor about an exercise program that's right for you. Your doctor may suggest a walking program. Check with your local hospital to see if it offers a cardiac rehabilitation program; if it does, talk to your doctor about enrolling in the program. When you're anxious or upset, your heart beats faster, you breathe more heavily and your blood pressure often goes up. This can make heart failure worse, since your heart is already having trouble meeting the body's demands. Find ways to reduce stress in your life. To give your heart a rest, try napping or putting your feet up when possible. If you're having shortness of breath, especially at night, sleep with your head propped up at a 45-degree angle using a pillow or a wedge. If you snore or have had other sleep problems, make sure you get tested for sleep apnea. Many of the factors that increase your risk of developing heart failure can be managed either by making lifestyle changes or by taking medicines. In particular, high blood pressure (hypertension) and smoking are risks for heart health, and tackling them could help reduce symptoms and improve quality of life. Giving up smoking (if you smoke) is likely to be the single biggest way to cut your risk of developing coronary heart disease and heart failure. Tobacco smoke can damage your heart in a number of ways, forcing it to work harder. Smoking also tends to make the blood thicker and slows down blood flow, increasing the risk of blood clots (thrombosis). It damages the linings of the arteries, causing them to fur up. This furring up of the arteries (atherosclerosis) is a main cause of coronary heart disease, stroke and some forms of dementia. Research has shown that you are up to four times more likely to give up smoking successfully if you use NHS support, together with stop-smoking medicines. Ask your GP about this or visit the NHS Smokefree website for more information. If your blood pressure is too high, your heart has to work harder to pump blood around your body. To cope with the extra effort, the heart muscle thickens over time, and will eventually become too stiff or weak to work properly. Keeping your blood pressure at a healthy level can stop or delay this happening so it may be useful to have your blood pressure checked regularly. It may be necessary to take blood pressure medicines (usually more than one) to get your blood pressure down to a healthy level. It is important you and your doctor choose the medicine or combination of medicines that will suit you. High levels of cholesterol (fat) in your blood can cause furring and narrowing of the arteries (atherosclerosis), heart attacks and strokes. The risk of coronary heart disease – and therefore heart failure – increases as the level of cholesterol in your blood increases. If you have other risk factors, such as high blood pressure or you smoke, the risk is even higher. If your cholesterol level is too high, your doctor will usually first advise you to make some changes to your diet (switching to a low-fat diet) and to take plenty of regular exercise. If, after a few months, your cholesterol level has not decreased, you will usually need to take cholesterol-lowering medicines called statins. If you are overweight, added pressure will be placed on your heart, increasing your risk of coronary heart disease and heart attack. Both of these make heart failure more likely. Following the advice below will help you lose weight, as well as lowering your risk of developing heart failure. If you already have heart problems, eating healthily can help protect your heart from getting worse, as well as protecting you from other diseases, such as diabetes and some types of cancer. Regular physical activity can keep your heart healthy and help you maintain a healthy weight. You do not need to join a gym or start running marathons, but including exercise in your daily routine will help. If you do not have a good level of mobility, you may be able to do arm or wheechair-based exercises. Drinking more than the recommended amount of alcohol can increase your blood pressure, which can lead to heart failure. Heavy drinking over a number of years can damage your heart muscle and lead directly to heart failure, as well as having many other harmful effects on your health. Men who regularly drink more than three to four units of alcohol a day, and women who regularly drink more than two to three units a day are likely to be damaging their health. Too much salt can raise your blood pressure, so reducing the amount you eat will help keep your blood pressure down and reduce your risk of developing heart failure. People of African-Caribbean descent appear to be more at risk of the harmful effects of salt compared with people from other ethnic groups. However, it is rarely helpful or necessary to have a diet that is very low in salt. Avoiding adding salt to food at the table or during cooking and not eating too much obvious salty foods, such as curry, salted snacks and pizza, is a good start. Heart failure is one of the most serious symptoms of heart disease. About two-thirds of all patients die within 5 years of diagnosis. However, some live beyond 5 years, even into old age. The outlook for an individual patient depends on the patient's age, severity of heart failure, overall health, and a number of other factors. As heart failure progresses, the effects can become quite severe, and patients often lose the ability to perform even modest physical activity. Eventually, the heart's reduced pumping capacity may interfere with routine functions, and patients may become unable to care for themselves. The loss in functional ability can occur quickly if the heart is further weakened by heart attacks or the worsening of other conditions that affect heart failure, such as diabetes and coronary heart disease. To improve the chances of surviving with heart failure, patients must take care of themselves. Even with the best care, heart failure can worsen, but patients who don't take care of themselves are almost writing themselves a prescription for poor health.